Kafka 0.9 was recently released, and now available as a beta Message Hub in Bluemix. Here's how to create a messaging producer on IBM Bluemix. Messaging systems have the benefit of decoupling the processing of data (consumers) from the data producers and with Kafka you can scale the consumers easily and separately. Furthermore, via asynchronous processing you can offload work and improve the application user experience. These capabilities are especially important for cloud native applications with microservices. 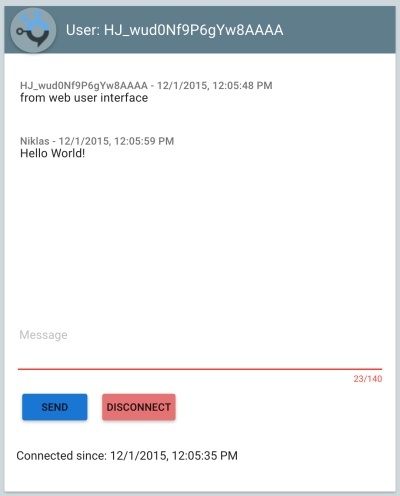 Recently Kafka 0.9 was released which is now available as Message Hub (beta) service in Bluemix. For developers there are different APIs available and my colleague Niall Weedon provided samples for how to use them. There is a Java API, a REST API and a Node.js API which wraps the REST API and adds IBM specific functionality like administration and easier authentication. The Node.js sample is a simple chat application. It uses the Node module cfenv to access the Bluemix environment variables and the Node module message-hub-rest to access Kafka. I modified the sample slightly to 1. separate the consumer from the producer and to 2. remove the chat sample application. Below is the minimal code for a producer. Tomorrow I’ll blog more about the consumer. You can run the producer either locally or on Bluemix. To run it on Bluemix, create a Bluemix Node.js application, add the Message Hub service and execute these commands from the project’s root directory. To run the producer locally, execute these commands. In order to test whether it works, deploy the sample chat application and connect to see the messages from your producer. Both the chat application and your producer application need to use the same Message Hub service. // (i.e. node app.js), start the service automatically.